Allowing you to keep warm without having to turn the central heating on to heat the whole house, the Beurer Cosy Luxury Heat Pad HK45 is a cost-efficient way of keeping cosy this winter. Its fast heating function will warm you up in minutes, while the high quality breathable micro fleece material is designed to provide warmth as well as being skin friendly, for the highest level of comfort. 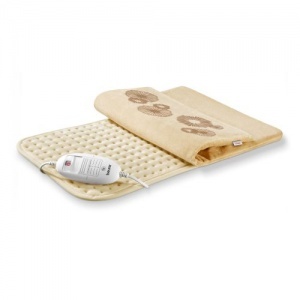 Whether you're suffering from Raynaud's phenomenon, poor blood circulation, arthritis, or simply cold feet and fingers, the Beurer Cosy Luxury Heat Pad can help you out. Heat therapy is known to relieve pain in stiff joints and sore muscles, as well as improve blood circulation and ease your Raynaud's disease symptoms. The three different temperature settings, controlled with an easy-to-use switch, allow you to always be just warm enough, while the automatic switch-off function lets you rest without having to worry about the device overheating. The Beurer Cosy Luxury Heat Pad HK45 has three different heat settings that allow you to find the right temperature for your needs. Please see the chart below for an explanation of the temperature output.